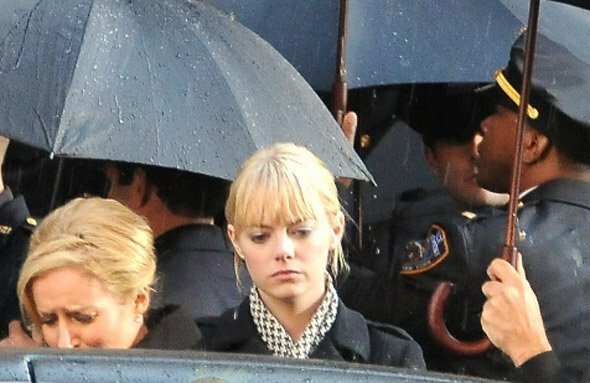 New photos of Emma Stone as Gwen Stacy filming on the set of the new Spider-Man reboot have surfaced, and it doesn’t look like she’s attending a happy occasion. There’s not a lot to see here, but let’s face it, almost everyone except me seems utterly obsessed with this movie and you probably want to see whatever there is, however meager the eyeball reward is. Warning! There’s a chance that these photos may be minor spoilers. Read no further if you don’t want to risk it. So here’s a couple of those Gwen Stacy hanging out in the rain wearing black and standing by a limo. It looks like a police funeral. Her father is a Police Captain, so that’s makes sense. Whose funeral is it? If you If I had to guess, I’d say it’s her dad’s. Post your guess in the comments section below. See three more images over where they originated at Superhero Hype.